March 21, 2019: Maulana Mushtaq Ahmed Sulaimani the resident Imam at San Fernando ASJA mosque passed away in his home country Pakistan where his funeral rites and burial took place today. It has been reported that Maulana Sulaimani was diagnosed with leukemia recently. He died while undergoing treatment in Pakistan early Thursday morning. His funeral was conducted in his hometown of Mansehra. Nephew Atif Sulaimani said his uncle had discovered just a month ago that he had cancer and sought treatment at a hospital overseas. Atif Sulaimani said while receiving chemotherapy, there were some side effects and Imam Moulana had to be placed in Intensive Care Unit (ICU) where he remained for two days until his passing. Maulana was born on February 12, 1952, in Abbottabad, Pakistan, the second of five children of Muhammad Yusuf Sulaimani and Chanan Jan. He wrote his ‘O’ Levels in Sherwan, Peshawar, and then ‘A’ Levels and B.A. at the Islamia College, Karachi, then an M.A. in Islamic Studies at Karachi University. He also studied Al Ijaza Al Aliya in Islamic Studies at the Aleemiyah Institute in Karachi, Pakistan, the institution founded in honour of His Eminence Maulana Abdul Aleem Siddiqui and headed by Maulana Dr. Fazlur Rahman Ansari. After graduating, he was invited to Zimbabwe in 1977 to take up a post of Imam and Islamic Missionary; he served there for six years. He got married at age 29 in North West Frontier Province, Pakistan, to Shakeela Rahaman. After Zimbabwe. Maulana accepted a position in Seychelles as an Imam. Missionary and Advisor to the Islamic Society of Seychelles. a post he held for four years. 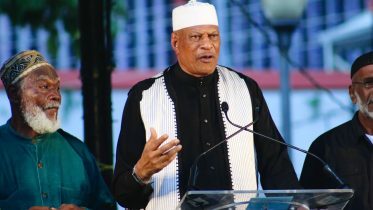 In 1988 he was offered a posting by ASJA in Trinidad and Tobago as Imam and Islamic Missionary for the Jama Masjid, Port Of Spain. 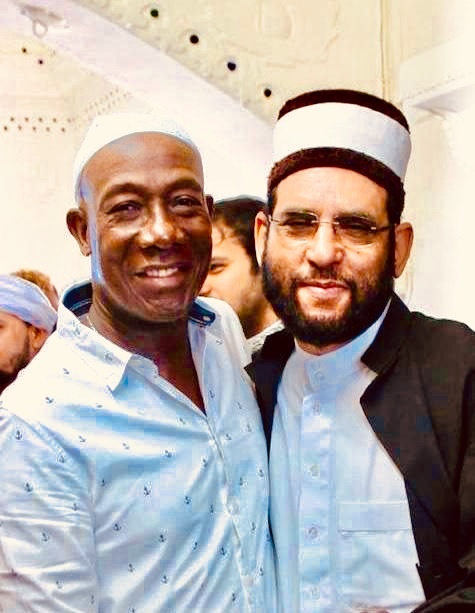 He spent one year in that position and in 1990, he was asked to be the Imam and Islamic Missionary at the San Fernando Jama Masjid, a post he continued to hold up to the time of his passing. In addition to his duties as Imam, Maulana Sahib hosted both radio and television programmes, Sadaa-e-Islam on a weekly basis and produced the Iqra News Bulletin — a yearly publication distributed on the eve of the month of Ramadhan. He is the loving father of a son, Jamil. Trinidad’s Minister of Local Government Kazim Hosein offered condolences and paid tribute to the deceased Imam. Minister Hosein said in his statement “With a heavy heart, I express my deepest condolences for the passing of my close spiritual guide, friend and brother in Islam, Maulana Mushtaq Ahmad Sulaimani. President of the San Fernando Jama Masjid Waheed Majid extended his condolences to the family of Sulaimani. Majid said Sulaimani was the Imam at the San Fernando masjid and has come to be a figure greatly respected and well-known. “He was a very jovial and friendly person. Many people came to him and he was well-known and widely accepted by all in Trinidad and Tobago. At some government functions, he was one the of religious leaders who would say a prayer which was an honour. He was very approachable and for us here his death is a great loss and we want to express our condolences to his family,” said Majid. San Fernando ASJA congregation will be holding nightly Quran readings at the mosque for Imam Sulaimani.